Crystar, later Crystal, was a Japanese camera maker of the 1950s. The company was perhaps founded in 1953, under the name Crystar Kōki K.K. (クリスター光機㈱, Kurisutā Kōki K.K. ), and first made the Crystar Flex TLR, distributed by Iwato Shōkai. The Sister Six folder was released in early 1954; at least one original document attributes it to Sister Kōgaku Kōgyō (シスター光学工業); this might be a separate company which merged into Crystar Kōki. The products of Crystar Kōki were distributed by Sumimitsu in early 1954 and by Lista Shōkai in the middle of the year. The address of the company at the time was Arakawa-ku Mikawashima 5–354 (荒川区三河島5–354) in Tokyo. The company name became K.K. Crystal (㈱クリスタル, K.K. Kurisutaru) between August and October 1954. The address remained unchanged until 1957. The last model of the company was the Crystar 35-S viewfinder camera. All trace is lost after August 1957. 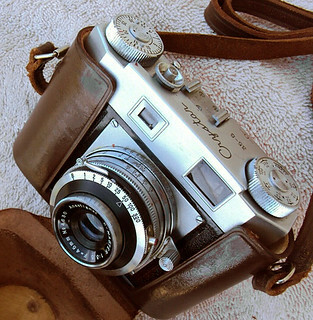 Not all cameras called Crystar were made by this company, and the Crystar 45 TLR distributed by Sumimitsu in mid-1954 was made by Ōshiro Seisakusho. It is not known whether the Hit-type Crystar camera is related to Crystar Kōki. ↑ Advertisement dated December 1953 reproduced in Kokusan kamera no rekishi, p.135. ↑ Extract from an unknown magazine, reproduced in Furukawa, p.23 of Camera Collectors' News no.275. ↑ Advertisements dated February, May and August 1954 reproduced in Kokusan kamera no rekishi, pp.135 and 140. ↑ Advertisement dated August 1954 reproduced in Kokusan kamera no rekishi, p.135. ↑ Advertisements reproduced in Kokusan kamera no rekishi, p.135. ↑ Advertisements dated June and November 1955, June 1956 and July 1957, reproduced in Kokusan kamera no rekishi, pp.135, 154, 155 and 240. ↑ August 1957: date of the last advertisements and articles mentioned in Kokusan kamera no rekishi, p.385 (item 1249). ↑ These are probably distributor names. See the Crystar page at tlr-cameras.com and this user manual at butkus.org. Furukawa Haruo (古川保男). "Orient Six: 'Bake no kawa hagareta oriento no shisha'" (Orient Six・'化けの皮剥がれたオリエントの使者', Orient Six: 'A messenger from the Orient, after having peeled off its skin'). In Camera Collectors' News no.275 (May 2000). Nishinomiya: Camera Collectors News-sha. Pp.21–3. McKeown, James M. and Joan C. McKeown's Price Guide to Antique and Classic Cameras, 12th Edition, 2005-2006. USA, Centennial Photo Service, 2004. ISBN 0-931838-40-1 (hardcover). ISBN 0-931838-41-X (softcover). Pp.231–2. This page was last edited on 13 February 2019, at 02:51.